Which is the Best Desk Chair for You? We started this site to help busy people find a quality seating solution quickly, with minimal time or effort. We’ve put together lots of different guides to serve all your seating needs. Here on our homepage, we’ve put together in-depth reviews of three of our all-time favorites. We’ll talk you through all their important features, and show you why we think they’re better than the competition. If you’re one of the millions of Americans who work in an office, sitting is a fact of life. However, many of us find ourselves stuck in badly designed, poorly built office chairs which squash our creativity and make our bodies ache. The key to making it through an 8-hour day at the office and coming out the other end happy and healthy is to get yourself a comfy seat! Switching up your seat is a win-win proposition for everyone involved. In an ergonomic, comfortable chair, productivity improves exponentially. That’s good for your company, whether you work for a large firm or run a small business from your home! Good seating also makes a vast difference in your overall health, from relieving back pain to preventing circulation problems. It’s a great way to improve your overall well-being, and it keeps your medical expenses down! Of course, with hundreds of options on the market, it can be quite an ordeal to find your perfect throne. Plus, you’re a busy person, and you don’t have time to spend hours shopping, comparing, and researching. That’s where we come in! This Amazon Basics model is one of the most affordable options on the market. We like it because it’s very cheap, but still has all the hallmarks of a great piece of office furniture. It’s adjustable, has an ergonomic design, and includes enough padding to get you through your desk work. This is an excellent choice for people who only work at a desk sporadically and want to save money, or people who need to get a comfortable seat on a very tight budget. It has an ergonomic design. While the Amazon Basics isn’t a premium model by any stretch, it does have all the essential features to keep you sitting straight. The waterfall edge helps you maintain proper circulation in your legs, and relieves pressure on your joints. The seat back provides basic lumbar support, to keep your pelvis at a proper tilt. Plus, the mesh material on the back helps distribute pressure better than most cushions. It has a padded seat for comfort. The padding relieves pressure on your hips, and makes this one feel less bare-bones than other budget options. We especially like the mesh back, which provides breathable support with an ergonomic curve. It’s adjustable. You can adjust the height of the seat using the easy side knob. It’s a pneumatic lift system, and we’ve found that it’s more dependable over the long haul than other budget models. You can also adjust the recline function. The Amazon model lets you change both the degree to which it reclines, and the tension controlling the recline. Tension control is pretty rare at this price, so it’s a nice plus for us. It’s extremely affordable. This model is actually one of the cheapest on the market, period. However, its sturdiness and overall good design make it a smarter purchase than other budget models. It’s very sturdy. The base, caster wheels, frame, and armrests are all built from nylon. We prefer nylon over the plastic parts used in most other budget models because it’s shatterproof. That means it can’t crack suddenly on you, so it’s much safer. It’s also less likely to warp over time. This one’s also covered by a 1-year warranty, so you won’t have to replace it anytime soon. The padding isn’t exactly plush. Previous buyers found that it wore down fairly steadily over the time they owned it. If you’re going to be using this as an all-day desk option, you may want to add a pillow to the seat. If you’re a heavier person, you might find a pillow essential, even from the get-go. The armrests aren’t adjustable. They’re also not padded, so they can be a bit uncomfortable as the day goes on. As you can expect at this price, quality control for this model isn’t that great. Some previous buyers received products with poorly-drilled bolt holes, or other blemishes. Most issues were just annoyances, and didn’t stop buyers from getting them set up. The Herman Miller Aeron is an absolute classic in the design world. While the more recent Embody has certainly stolen some of its thunder, the Aeron remains one of the best office chairs ever made. It’s our top choice for folks who like something relatively traditional, with smart ergonomic design and a lower price tag than the exorbitant Embody. While it has a lot of smart ergonomic design features, it still feels familiar. More recent pieces like the Embody can look a bit outlandish in traditional office environments. The Aeron looks good in a whole range of settings, with an aesthetic that’s modern but preserves a traditional format. It’s much more comfortable than any traditional office chair, though! Its PostureFit mechanism supports a natural forward pelvic tilt. That prevents back pain which can often be caused by chairs which allow caving in the lower back. The Aeron encourages core engagement, proper posture, and better spine alignment than models which encourage you to sink in. The Aeron’s support/padding material is also anything but traditional. The whole thing uses a “pellicle” suspension system rather than solid padding. It’s like mesh in many ways, but more sophisticated. It can constantly adapt and adjust to the way your body shifts, to prevent any pressure points or circulation issues. Plus, the material does an awesome job dissipating heat! Since it’s porous like mesh, you shouldn’t have any sweating issues whatsoever in one of these. The tilt mechanism is totally redesigned to help the chair move as an extension of your body. Your joints feel more fluid, so you don’t feel like you’re working against the chair as you lean. The back is tall and wide to support your whole back as you work, in order to reduce any pressure on your lower back and lumbar area. Little curved lines like the backs of the armrests and front of the seat encourage better circulation with less pinching and discomfort in your chair. Design doesn’t get much better than this! We’ve covered a lot of the key features that we’ve found make a big difference in comfort. Still, it’s worth mentioning just how many awards this thing has won. A quick Google search will show you how much it’s changed the game in furniture design. The Aeron even has a spot in the New York Museum of Modern Art! Since it’s been on the market for a number of years, it’s less expensive than the Embody. You’ll save several hundred dollars by going with this one. It can also be found on sale much more frequently than the newer Herman Miller. It comes in three sizes. That makes it easy to find the best one for your body! Sizing charts are easy to find online. Each of those sizes comes in lots of color options, too. There’s anything from classic black, steel, and white options to bold color blocks. The build quality is miles better than the Amazon Basics. We don’t have any complaints in that department! One of the distinguishing features of Herman Miller chairs is their range of adjustments. There are actually 9 different ways to tweak the chair to suit you! You can set the tilt limits, determining how far the back will go. You can also tweak the tension in the tilting mechanism to control how easily the seat leans back to begin with! One unique feature we love: you can adjust the angle of the seat as well as the back of the chair. It works in both normal (level) mode and “engaged” mode, which is set at a 5 degree forward tilt. That might not seem super comfortable on paper, but it does wonders for concentration. This is an expensive piece of furniture, but it’s a solid long-term investment. The Aeron comes with a 12-year warranty, and stands up well to daily use. It’s ethical. With over 50% of the construction materials being from recycled sources, and nearly the entire chair being recyclable at the end of its working life, this is a responsible piece of furniture! While the Aeron is hundreds of dollars cheaper than the Embody, it’s still a high-end piece. We think it’s more than worth it if you sit all day for work, but we know it could be a big investment for some people. If you’re trying to figure out whether the cost is worth it to you, bear in mind that the 12-year warranty means you won’t need to buy a replacement anytime soon! 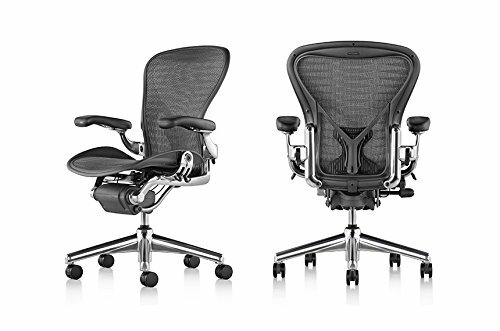 The Aeron has lots of options for adjustment, plus the 3 different size offerings. Still, no chair will be universally comfortable for every user! We’d encourage you to go try one in person before buying, or to make sure you have free returns when you pull the plug. Likewise, while this is vastly better than anything else in its price range, we do think the Embody is genuinely a better chair. It’s even more adjustable, and takes the whole adaptive quality of the Aeron to a completely different level. Our ultimate recommendation for an office chair is the Herman Miller Embody. It’s really in a class of its own in terms of the sheer sophistication and technology of the design. This one is designed to do more than simply passively support your body. It was designed with doctors to actually stimulate blood flow, keep up your focus, and positively align your spine as you shift and adjust in your seat. It’s almost infinitely adjustable, and it’s covered by a great warranty. If you’re looking for the absolute best ergonomic solution, the Embody is your best bet. It’s designed differently from other models. Most traditional ergonomic thinking looks for ways to make them less detrimental to posture and spinal health. The Embody was designed to not only be neutral, but actually have a positive effect on health. To achieve that goal, the design team worked with 20 different doctors and scientists. You can see all that research and planning in the design itself. The backing of it mimics the human spine. There’s a central support column, which connects to lots of smaller support pieces, which work like little ribs along the back of the chair. They create a matrix of support points which can move with you over the course of the day. That allows for two things: they distribute weight, and adjust constantly to make sure your spine stays aligned. Overall, the Embody works to dissipate pressure from all parts of your body, while making sure your spine is aligned and supported. The result is better blood flow, healthier posture, and reduced stress. Your back experiences less spinal compression, so blood and other fluids can flow more easily. Because it’s not a rigid design, it actually encourages movement and adjustment, so you don’t feel stuck and restless. The flexibility also helps prevent pressure points from forming, no matter your body shape. Previous buyers said they eventually didn’t notice the chair was there, which is clearly the hallmark of a comfortable seat. They also noted that they’d seen definite improvements in their posture when they stood up, as well as sitting at the desk. One of the other signature features of the Embody (and the rest of the Herman Miller line) is the superb adjustment options. You can adjust pretty much every feature on this one, so it’s easy to fit to your own specific body shape and size. You can adjust the seat height, as well as the depth of the seat itself. The lumbar support is adjustable, and so is the back support column. There are also not only height but width adjustments for the armrests. That’s lots of room to customize it to your own preferences and needs. You can also adjust the back support feature (that spinal column you can see on the back of it) to suit your own body. That helps keep all the support features and comfort zones lined up where you need them. The back support then moves with you, so you’re supported no matter how you sit. It places special emphasis on supporting the lower back, aligning the neck area, and keeping your pelvis tilted slightly forward. The upholstery is innovative, as well. It’s a hybrid fabric that feels somewhere between cloth and mesh. We like it because it’s smooth and comfortable like traditional upholstery, but with the breathability of mesh. The armrests are padded in the same fabric. It’s very eco-friendly. Herman Miller makes its products in a factory which uses only renewable energy. Plus, the Embody, which is made mostly from recycled materials, is 95% recyclable when you’re done with it. It’s sturdily built, and guaranteed to last. The Embody is guaranteed by warranty to last you for at least 12 years. It’s very, very expensive. The price alone may make it cost-prohibitive for some people. However, if you’re working from a chair 40 hours per week, it’s a fairly reasonable investment. You should also consider the fact that this is guaranteed to last for 12 years. Even though it’s adjustable and versatile enough to fit just about anybody, it’s not going to be every buyer’s favorite model. While the Embody provides all-over pressure relief, it’s not a thickly cushioned seat. It relies on ergonomic benefits to make you comfortable. If you’re the sort of person who likes a big, plush chair you can really sink into, the Embody probably won’t be for you. However, we would certainly encourage newcomers to try it. Many previous buyers wrote in their reviews that it felt strange at first, but once they found their comfort zone, they didn’t want to go back to traditional models. The Amazon Basics is by far the least expensive option, so it’ll be the obvious choice for people on a tight budget. It’s a good, no-frills option for people who want one that serves all their basic needs without a lot of fancy extras. It’s sturdy, provides basic ergonomics, and enough cushioning to get you through your desk work. However, it’s not very thickly padded, so it’s probably not the best choice for people who are at a desk all day long. We’d recommend it to people who sit at a desk sporadically through the day, who need something basic to get the job done. The Serta provides a lot more comfort for only a slightly higher price tag, so we’re actually giving it our best value prize. Even though the Amazon Basics is a bit more affordable, we think the Serta’s full cushioning and high backed design give you more bang for your buck. The headrest and extra height make it a better choice for taller users, and the thick body cushions make it more comfortable for all-day office workers. On the downside, this isn’t the most adjustable model in the world, and it’s still fairly basic in terms of ergonomics. The Herman Miller Embody is vastly more expensive than our other two recommendations, but we think it offers a world of difference in terms of comfort, ergonomics, and flexibility. It’s the only one of our recommendations that can have a positive, not just neutral, effect on your working health. With its innovative support system, flexible design, and many adjustments, it’s our favorite model on the market right now, period! If you’re working from a desk 8 hours a day, you should consider investing in this one. It’s expensive, but when buyers looked at that cost over the decade that it’s guaranteed to last, it looked a lot easier to stomach. With that said, the sheer cost may make it inaccessible to some buyers. We’ve just taken an in-depth look at some of our favorite all-around chairs. But we didn’t stop there! We’ve also compiled lots of different guides to help you find the best models in all the most popular categories, from gaming to kneeling, and everything in between. Gaming is one of the most popular hobbies in the world. It’s a great way to de-stress, get competitive, and sharpen your problem solving abilities. However, it can also lead to just as many posture and back problems as sitting at a desk all day. Gamers tend to slouch, or sink into a couch, which can cause major issues over a multi-hour gaming session. That’s why you need a proper gaming chair. Thankfully, there are lots to choose from! Of course, nobody wants to spend valuable gaming time shopping online. Well, you’re in luck! We’ve come up with a special guide to the best chairs especially for gamers! We’ll discuss all the key feature that help you up your game, and hit that next level of comfort! The X-Rocker is one of the best-selling gaming chairs ever, and it’s currently #1 on Amazon! It’s a laid-back rocker design which is perfect for your next gaming night, or for kicking back and watching a movie. We like this model over the other X Rockers because it’s set up on a pedestal. That gives it the comfort of the rocker design while giving you a bit more height to game at a desk, or with a TV set up for a traditional chair or sofa. The rocker design helps this one feel like more of a personal, supportive couch, as opposed to a straight-backed desk chair. It allows you to sit back and relax without causing postural issues. Of course, the main feature that sets this model apart is the built-in surround sound. There are three speakers set into the seat itself, so you hear audio and music all around you as you game! That really boosts the experience, and gives you a more immersive session. We also love the wireless connectivity, which lets you sync everything up without tying you down. If you’re looking for a gaming chair that’ll become a central part of your setup, the X-Rocker is for you. Read more about the X-Rocker, and find more of our favorite gaming chairs in the guide! Back pain plagues millions of Americans every day. Between posture problems, muscle spasms, and general soreness, it’s a serious sitting epidemic. It’s also one of the most challenging health problems to solve, because each type of back pain can require different features in a chair. To help out, we’ve gone on a comprehensive search for solutions! We looked at dozens of chairs, from ergonomic uprights to kneeling chairs, and all sorts of other options. You can find all our recommendations in our special guide. This Safco model is a sort of hybrid between the frame and height of an upright chair, and the core-engaging ergonomics of an exercise ball. It uses a modified exercise ball, which is set inside a traditional four-legged chair frame. We like this hybrid design because it’s much sturdier than the frames you get with other ball chairs. It also protects the ball from puncture, and keeps it from rolling away. We particularly like the cloth covering on the top of the seat, which provides a traditional upholstery feel instead of a staticky exercise ball surface. It comes in a few different colors, so you can choose a traditional black, or go for a funky color like red or green. It also comes with the air pump included, and previous buyers said it’s super easy to get set up and sitting! If you’re looking for a funky but functional non-traditional solution, the Safco just might be for you. You can find lots more of our favorite solutions for back pain, from ergonomic upright chairs to kneeling chairs in our special guide! Read our page for best office chairs for back pain. If you spend lots of your time at your desk, in meetings, or having some thinking time in your office, you need a chair that’s comfortable enough to spend the day in. Of course, comfort means something a little different to all of us, so you need a chair that strikes your ideal balance between cushioning and support. When we set out to compile our guide to the most comfortable chairs on the market, we tried to find a list of recommendations that included something for everyone. Whether you like a big, plush executive chair, or a minimalist ergonomic chair, we’ve found great options for you! This La-Z-Boy is one of the most comfortable chairs we’ve ever reviewed. It’s a premium leather executive chair with tons of padding and a heavy-duty frame which can handle even the tallest and heaviest of users. For the rest of us, it’s a big, deluxe chair that you can relax in with both support and pillowing for all-day comfort. The best part is there’s lots of room to move around. This model has a wide seat, and a nice high back with plenty of room for your shoulders, head, and neck. It’s padded with memory foam, and covered with premium leather. Everything about this chair says comfort! Read our full review, and find lots more comfortable options here! We all want a great office chair, but some of us can’t spend too much on a Herman Miller. At the same time, so many budget options are awkward or just plain uncomfortable. They have skimpy cushioning, poor ergonomics, and shaky durability. Don’t worry! We’ve put our researchers to work on a special mission to find a few great chairs that we can all afford. We’ve thought about all the basic features of a great office chair, and made sure our recommendations tick all the boxes without breaking the bank! One of our favorite options is this Amazon Basics model. We looked at one of its sibling models in our all-around Top Three. This model is the low-back version, and it’s great for shorter people on a budget, or for people who just like a stronger low and mid back support. While you’re not going to get any premium features at this price, you will get all the basic comfort features you need to make it through the workday. It has height adjustment, an adjustable tilt setting, and 360-degree swivel. Both the seat and the back of the chair are fully padded, with an ergonomic design to keep your back straight at your desk. It’s sturdily built, with a shatterproof nylon base and a weight rating up to 250 pounds. It’s cheap, you also can’t beat the price. We recommend this one to people who sit at a desk periodically throughout the day, but not often enough to justify spending a lot for a chair. Find the rest of our budget recommendations, and find out how to shop for the best office chair under $200 in our special guide! The more we learn about the health risks of sitting all day, the more we’ve realized just how crucial ergonomics play in mitigating those risks. Ergonomic chairs provide carefully-aligned support which keeps your spine aligned all day long. They also distribute your body weight evenly over the surface of the chair, to prevent pressure spots from building up and causing you discomfort. In short, proper ergonomics keep you more active and alert at your desk, and play a big role in keeping you healthy through the workday. For those of us who aren’t physicians, it can sometimes be a challenge to figure out which chairs are actually the most ergonomic. That’s why we put a special guide together to help you find the best options. We’ve looked at a whole range of ergonomic chairs, to suit lots of body types as well as lots of budgets. One of the best ergonomic chairs out there right now is the Herman Miller Aeron. This chair first came out in the 1990s, and won the Design of the Decade award at the end of the century. It’s also been a mainstay in the top three ergonomic chair options in medical studies, consumer magazines, and office supply ratings ever since. It’s actually been on the market for a while, but in the 20 years since it was first released, Herman Miller has made some improvements to make it even better. We like the Aeron in 2019 because it combines the best of modern ergonomics with a traditional executive chair shape. This chair uses a pellicle mesh suspension system to dissipate pressure and keep body heat from building up in any part of the seat or back. We like it because it provides a great balance of support and pressure relief without lots of bulky cushions. It’s also very, very adjustable. You can get this one in three different sizes, and make adjustments to nearly every aspect of the chair itself once you put it together. This one has adjustable seat height, seat depth, armrest height, lumbar support, and more. Since it’s so versatile, it’s ergonomic for almost every unique body! Find out more about the Aeron, read our full in-depth review, and see the rest of our top recommendations in our Best Ergonomic Office Chair guide! Kneeling chairs have been one of the most popular forms of alternative seating for over 30 years now. They modify the traditional, 90-degree seated posture to a more dynamic, forward-tilting kneeling pose. The basic theory is that by opening up your posture, you’re engaging your core and preventing spinal compression. That keeps you more active and alert, and helps build proper posture better than traditional chairs. The forward-tilted seat also makes sure your pelvis is tilted slightly forward, which helps keep your back and lumbar muscles happy. These chairs have padding both on the seats and on the knee pads, and some of them even have padded backrests like a traditional upright chair. Overall, though, a lot of kneeling chairs have the same basic design. However, they’re a bit of a niche item, and can be a bit hard to shop for. There are fewer models to choose from, and there’s not as much feedback from buyers to examine. Kneeling chairs can also be a bit hard to judge because they have so many mixed reviews, and research studies looking at their benefits have also been fairly mixed. In our guide to the Best Kneeling Chairs, will take a brief look at the theories and research behind the kneeling chair, and then take a closer look at the models we’ve currently rated best in the category. We’ll talk through why previous buyers might have had mixed experiences, and we’ll discuss which consumers should buy a kneeling chair, and which people might find them uncomfortable. One of our top recommendations in the kneeling category is this model from Sierra Comfort. It’s a high-end kneeling chair with a sturdy metal frame, thick cushions, and lots of adjustments to help you find your perfect comfort setting. We like the Sierra Comfort because it’s one of the only kneeling chairs on the market with independent adjustments for the both the height and angle of the seat. Most other models require you to use the same knob to adjust both, which means that any change in height means a change in angle and vice versa. The Sierra Comfort also has much deeper cushioning than other models, with a full three inches on the knee pads and the seat. We particularly like that it’s memory foam, which provides more support and lasts longer than traditional fiber fill or polyurethane foam padding. If you’re looking for the most adjustable, ergonomic kneeling chair out there, this is it! You can find our full review of the Sierra Comfort, and see how it compares to our other kneeling chair recommendations in our special guide! The centerpiece of any executive office is the chair. A proper executive chair looks and feels impressive. It’s a throne from which you can make all your important decisions, have inspirational thinking time, or cut that big deal across your desk. With so many competing for your company’s dollars, it can be a bit of a process to find the best ones. That’s why we’ve put a special guide together just for you! We’ve come up with a handy list of executive chairs that will keep you comfortable and at the top of your game while you work. They all have a slightly different look and feel, so you can find the model that best suits your aesthetic as well as managerial style. Plus, we’ve come up with options to meet just about any bottom line. The Office Star has the look and feel of a premium leather chair, at a much lower price. It uses a hybrid eco-leather material for the upholstery. It looks pretty much like real leather, since it’s made from a mix of recycled leather and other composites. Previous buyers said you couldn’t tell the difference unless you got super close. We also like the Office Star for its thick, all-over cushioning, which keeps aches and pains at bay for long days at the office. It has key ergonomic support in the lumbar, and a thickly padded headrest to keep your neck comfortable. We also really like the adjustable armrests, which are padded in leather as well. If you want something that looks and feels high-end and impressive, without making a big dent in your profit margin, you should take a look at the Office Star! Read our full, in-depth review of the Office Star, and see the rest of our favorite executive chair options in our dedicated guide here! Want to compare more top-rated office chairs? Check out the best sellers on Amazon!